My guest for this episode is Adrielle Stapleton, a Relocation Consultant making her way in Lexington, Kentucky after three years in Germany. Adrielle is discovering that the life strategies that worked in Boston, her home before Germany, don't necessarily translate to Lexington despite both cities being in the US. Adrielle and I talked about the confusing process of gaining cultural fluency wherever you may find yourself, building a professional and social network from scratch, and her “good enough” philosophy that applies to expats and repats alike. Please remember to subscribe and leave us a review! If you would like to learn more about Adrielle, you can visit her website, Stapleton Relocation Consulting, or check out her Twitter. We love to read your comments and feedback! A former American-expat-in-Switzerland, Lindsey McLean found her life turned upside down and her identity entirely erased when she left her expat life and moved back home in 2014. 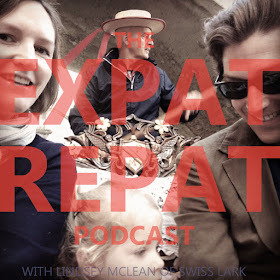 The Expat Repat Podcast explores all the ins and outs of expat life, including the biggest one of all: moving home. Please subscribe on iTunes! And thank you for visiting.